Book Review Provoke: Between Protest and Performance Edited by Diane Dufour and Matthew S. Witkovsky Reviewed by Adam Bell Despite covering a period roughly fifty-years ago, Provoke: Between Protest and Performance, took years of groundwork before it was possible in the West. Simply put, Japanese photography is finally getting the recognition and scholarly treatment it deserves after years of relative neglect by the West. Designed by Pierre Hourquet. Steidl, 2016. Despite covering a period roughly fifty-years ago, Provoke: Between Protest and Performance, took years of groundwork before it was possible in the West. Simply put, Japanese photography is finally getting the recognition and scholarly treatment it deserves after years of relative neglect by the West. To give some context, as recently as 2002, I was one of five people, including the artist and gallerist, at Daidō Moriyama’s book signing and opening for ’71 – NY at Andrew Roth Gallery in New York City. Flash-forward to 2011, Moriyama restaged a 1974 book-making event at Aperture in New York City and hundreds waited to get a customizable, limited-edition book from the acclaimed photographer. Although merely one figure in Japanese photography’s long-tradition, Moriyama’s lack of recognition and subsequent acclaim follows a pattern that is fortunately being addressed. In other words, we’re finally catching up. Since the early 2000s, multiple English language books and exhibitions have addressed the history of Japanese photography, and in particular the fertile period of the 60s and 70s in Japan, including The History of Japanese Photography, Setting Sun: Writings by Japanese Photographers, Japanese Photobooks from the 1960s and 70s, and most recently For a New World to Come: Experiments in Japanese Art and Photography, 1968-1974. This renewed interest might also be seen as running in tandem with the renewed appreciation of the photobook and its centrality in the dissemination of Japanese photography since the 60s. Provoke: Between Protest and Performance is an astonishing achievement and will be the benchmark for all subsequent treatments of this era for years to come. Combining scholarly essays, historic and contemporary interviews, translated texts from historical publications, and lush reproductions of rare publications, the book offers incredible insight and access into this important period of the medium. Provoke: Between Protest and Performance. Edited by Diane Dufour and Matthew S. Witkovsky. Designed by Pierre Hourquet. Steidl, 2016. At the center of this massive tome is a small magazine that ran for three issues. Founded in 1968 by the critic Kōji Taki, the writer Takahiko Okada, and photographers Takuma Nakahira, and Yakata Takanashi (Daidō Moriyama, a crucial member, joined after the first issue), Provoke’s cultural and creative impact spread far and wide, and can hardly be limited to those magazines alone. They also produced influential books. 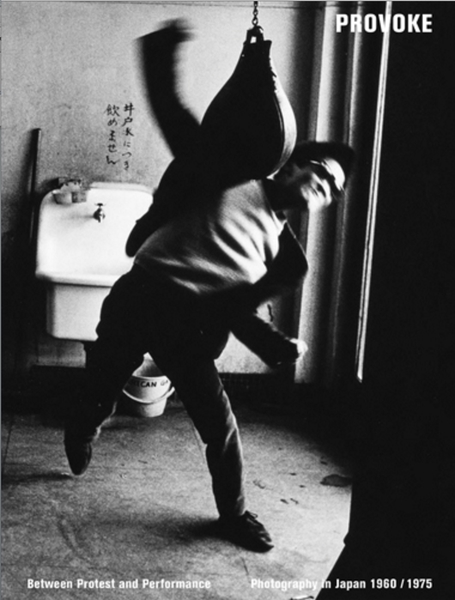 The first issue of Provoke was published in 1968, but the book covers a period of economic, social and creative turmoil in Japan from the early 60s to mid-70s. Emerging from the post-WWII period, Japan was grappling with the effects of rapid modernization and commercialization. Students were taking to the streets and old traditions were being challenged. As the book’s title suggests, Provoke, both as the magazine and loosely affiliated group of artists, is placed between the socially engaged, documentary photography that supported and emerged out of the student protests of the 1960s and the concurrent, performance-based work that began in the early 60s and flourished up until the mid-70s. Provoke, in the words of the authors, is “a pivot between protest and performance, politics and art.” An oppositional, but vital thread that coincided with and informed these trends, Provoke offers unique insight into the period. The book opens with a section on the protest photography that emerged along with the student uprisings in the early 60s. Although protests in the late 60s and 70s often involved opposition to the Vietnam War and Japan’s cooperation with the US, the first wave of student protest centered around the renewal of the Treaty of Mutual Cooperation and Security between the United States and Japan, or Anpo as it was commonly known. Highly collaborative, the resulting books and publications often did not have a single author and were as much documents of specific actions or protests as they were propagandistic tracts to inspire and cultivate support among fellow students. At the same time, there were also more individualistic books like Chizu, or The Map by Kikuji Kawada, easily one of the most famous books of that era from Japan. The second section tackles both the magazine and books produced by the individuals involved in Provoke. As a whole, the book does an admirable job of contextualizing the radicalism of Provoke, while also broadening the field of view for this creatively fertile period, demonstrating that Provoke did not emerge whole-cloth in the late-60s. Wedding inventive and experimental design with jarring, unsettling images, artists during this time sought to create a new visual language that confronted and visualized the difficulty and turmoil of the era. Along side the grainy, blurry and out-of-focus (are-bure-boke) photographs, manifestos declared the need for a new visual language that stood apart from the written word and challenged the staid photographic language of the time. Provoke has received the lion-share of attention over the years and it gets the deserved star-treatment here, but it’s refreshing to see the prodigious outpouring of creative work at the time by those unaffiliated with the group. The protest and performance work is a revelation. The final section is dedicated to performance-based work that emerged in the late 50s, flowered in the 60s, and continued through the early-to-mid 70s. Actions, happenings, and events all occurred around the same time as the massive protests, and were promoted by artists associated with the Gutai group, butoh dancers, and various other groups like Hi Red Center and Mono-ha. This section includes such well-known examples as Nobuyoshi Araki’s Xerox Photo Albums and Eikō Hosoe’s Kamaitachi, but also lesser-known works like the filmed performances of the Hi Red Center collective. Although linked, the authors are careful not to overstate the relation between these different threads of artistic practice. The artists involved in Provoke were often apolitical, and the students and photographers involved in the protests rarely paid any attention to the members of Provoke. According to the authors, Provoke “bound photography to political and social protest on the one hand, and to avant-garde performance on the other.” Linking all these strands are affinities of confrontation, agitation, and the desire for new forms of imaging and communication in the face of social and cultural change. The book’s design is also a pleasure. Each of the themes — protest, provoke, and performance — is given its own color-coded section with black for protest, middle gray for provoke, and light gray for performance. Filled with images and reproduced spreads, each section is also interspersed with translated texts from the various publications reproduced, and followed by a contemporary essay and one or more interviews with the artists included. Incredibly, large sections of well-known books, like Farewell Photography by Daidō Moriyama and For a Language of Come by Takuma Nakahira, are amply reproduced as spreads throughout each section, but so are more obscure publications. In the provoke section, all three issues of Provoke magazine are reproduced in their entirety. While these seminal works are often reproduced in various books on books, it’s a rare opportunity to see them that’s not to be missed. For those familiar with this work, the two other sections offer their own riches, like examples of obscure protest books from the 60s and documentation of performances from in the 70s. As a pleasurable side note, the book positively reeks of ink — a testament to the lush, dark images contained within its pages.